Galganov's Recipe for Chocolate Covered Cherries! a sheet of parchment (or wax) paper on a cookie sheet (to cool the coated fruit). a chocolate thermometer (is recommended). Melt chocolate chips in the top of a double boiler -stirring continuously- to about 117°F (47°C). Cool chocolate to about 85°F (29°C). Reheat chocolate to about 90°F (32°C). 86°F (30°C) is recommended for milk or white chocolate. 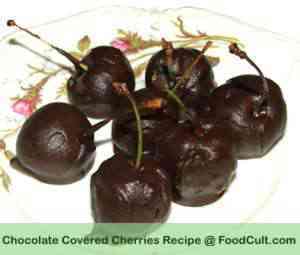 Dip cherries in hot chocolate and transfer to parchment (or wax) paper to cool. Stir chocolate regularly to keep it from burning. Let chocolate cool (avoid using the fridge to cool the chocolate). Under normal conditions, the chocolate should harden in about two to three hours. Note: You will notice you are directed to heat/melt the chocolate, cool it and then heat it up again. This process will allow the chocolate to harden at room temperature. Not doing so will result in runny chocolate. Temperature in this process does matter. Chocolate tip: While refrigerating chocolate may turn your chocolate white it will freeze well, if well wrapped to protect from moisture, for a good long time. To freeze - wrap well, refrigerate for 24 hours then move to the freezer. To defrost, refrigerate for 24 hours, then unwrap to let the moisture escape and let stand at room temperature 'til ready. Also known as an amuse-gueule, this Chocolate Dipped Cherry is impressively easy to prepare and is the perfect amuse-bouche (French for "that which amuses the mouth") between courses. While the Chocolate Dipped (or Chocolate Covered) Cherry is a delightful desert element it is also a wonderful way to refresh your palate before the next course! This recipe uses fresh, sweet cherries - almost any variety of sweet cherry will work nicely, ie, bing, hedelfingen, Royal Anne, van, etc. We use, for this treat, a semi-sweet chocolate. This offsets the sweetness a little - you can enjoy the fresh, sweet cherry without being overcome by sweet chocolate.